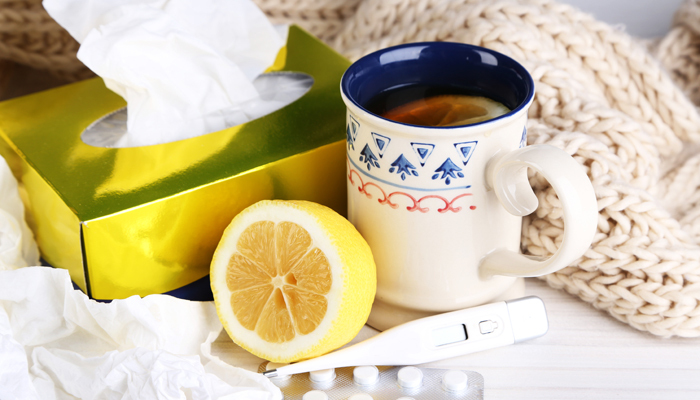 Did you know that 60% of people with flu symptoms leave the house during their illness? Furthermore, 70% of them go to the drugstore. A good reason to stay clear of the pharmacy during peak cold and flu season! Good preparation involves a lot more than a vaccine. Cold and flu germs are highly contagious. If an infected person sneezes, anyone within a 3-foot radius is likely to get exposed. And those flu germs live up to 24 hours on hard surfaces. Not to mention that the sick person unwittingly starts spreading germs as early as three days BEFORE feeling any symptoms and continues to be contagious up to 24 hours after the natural break of a fever. Get the flu vaccine. Even if it’s not a perfect match with this year’s influenza virus, it will minimize the intensity of symptoms. Get eight hours of sleep at night. In one study, those who got fewer hours were three times more likely to catch a cold. Wash hands often. Touching hard surfaces (counters, doorknobs, the poles on public transit) is a sure-fire way to bring germs into your body, usually through rubbing your eyes or eating. Frequently clean surfaces at home and work. Shy away from crowded situations. wedged pillows to sit (and sleep) more upright. Are you prepared for getting sick? Very likely you have many people relying upon you. And as a family member, you don’t readily get a “sick day.” As the Roanoke and Lynchburg experts in family caregiving, we at Gentle Shepherd Hospice see family members work themselves so hard that they frequently succumb during cold and flu season. Let us help relieve the stress ahead of time so you have a chance to dodge the illness. Give us a call at 1-800-789-0586 (toll-free).